UltraWide vs Dual Monitors – Which Should You Choose? Overall, ultrawide monitors provide a more immersive gaming experience, but they’re not the best when it comes to competitive fast-paced gameplay. As far as professional use is concerned, depending on the resolution, a dual monitor setup will provide you with more screen real estate but you will also have to cope with the bezel/gap in-between the monitors. However, ultrawide monitors are also exceptionally useful for professional audio/video editors as you get a wider preview of timelines. Moreover, for most people, a high-resolution ultrawide display offers more than enough screen space. Deciding between an ultrawide display or a dual monitor setup depends on what type of video games you play as well as on what kind of work you do. You will also have to take into account other monitor specifications such as panel type, size/resolution, refresh rate, etc. In this article, you’ll find everything you need to know in order to make an informed decision about your next display. For comparison, we’ll be using the most popular widescreen and ultrawide screen size/resolution combinations: a 34″ 3440×1440 ultrawide or a dual 27″ 1440p setup – and a 29″ 2560×1080 ultrawide or a dual 24″ 1080p setup. So, a 27″ 2560×1440 monitor will provide you with roughly the same pixel density (pixel-per-inch ratio) as a 34″ 1440p ultrawide while a 23″-24″ 1080p monitor offers roughly the same pixel density as a 29″ 2560×1080 ultrawide. With ultrawide displays, you get ~33% of extra horizontal screen space in comparison to a single 16:9 display meaning that dual monitors provide more workspace than an ultrawide. There are also 32:9 “super-wide” ultrawide monitors which actually provide you with screen size and space equal to two 16:9 displays, though at a higher price. We recommend curved ultrawide monitors over the flat ones as the curvature provides a more immersive viewing experience with less distortion. When it comes to regular widescreen displays, a single curved monitor doesn’t have as a noticeable effect. However, for a dual or multiple monitor setup, we suggest curved monitors as you’d need to have flat monitors aligned at an angle anyway. If you want to get as much screen space as you can, then a dual or multiple monitor setup is the way to go. However, make sure you’re getting a monitor with a high pixel density. For instance, a 27″ monitor with 1920×1080 resolution has a low pixel density of 81 PPI (pixels per inch) which results in limited screen space and smudgy details. In this case, if you can’t afford a 2560×1440 monitor, you’re better off with a 24″ 1920×1080 monitor which has a pixel density of 91 PPI and therefore a much sharper and spacious picture. When it comes to color-critical tasks, there are additional things to consider. 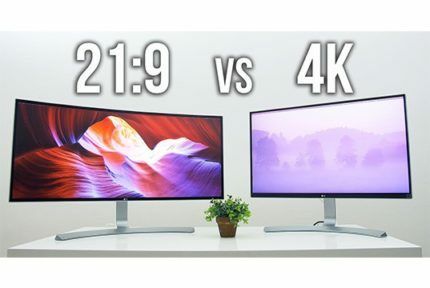 First of all, even if you buy two identical monitors, they will likely have at least slightly differently calibrated colors, contrast, uniformity, etc. Getting both monitors to display identical colors can be quite frustrating if you don’t have the proper equipment such as an expensive monitor colorimeter device and calibration software. Moreover, due to their wider screen, ultrawide displays provide a wider preview of timelines which can be very useful for audio editing, video editing, and overall content creation. Since most video editing software require a secondary display to preview your work, you should, ideally, get a dual setup consisting of one ultrawide and one regular monitor, or even two ultrawides – if you can afford it. Lastly, there’s such a thing as too much screen space. If you put two 27″ 1440p monitor side by side, you may find that you have to move your head from one side to another a lot or that you end up not using all the space available. In the end, it comes down to how much space you need and what type of work you do. For professional use, we recommend ultrawide monitors with IPS panels as they offer the widest viewing angles as well as the and most accurate and consistent color reproduction. Gaming on a dual monitor setup is not recommended because you’d have a crosshair or your character right where the monitor bezels meet; unless you plan on using one monitor for gaming and the other for web-surfing, chatting, etc. In this case, multiple monitors make more sense since you can put one monitor on your left, and on your right, and one in the center thus increasing your field of view which is a particularly popular setup for racing games. On the other hand, an ultrawide gaming monitor will provide you with a more seamless and immersive gaming experience without any bezels and gaps. And, it’s also a cheaper and simpler option. There are a few things you should keep in mind about gaming on an ultrawide display. First of all, not all games support the 21:9 aspect ratio which results in either a stretched out picture or black borders around the screen. You can check a list of all games that support ultrawide resolutions here. Also, because ultrawide monitors offer a wider field of view in video games, you get a big advantage over other players as you can spot the enemies from the left or right more quickly and have a better view of the map in RTS games. That’s why some competitive games such as StarCraft II, limit the aspect ratio to 16:9. So, make sure to check out whether your favorite games support 21:9. For fast-paced gaming, we recommend IPS-panel ultrawide displays as they offer a faster response time speed as opposed to VA-panel models. If you prefer more graphically-oriented games, VA panels will provide you with a higher contrast ratio which results in deeper black shades and more vivid details in shadows and highlights of the picture. 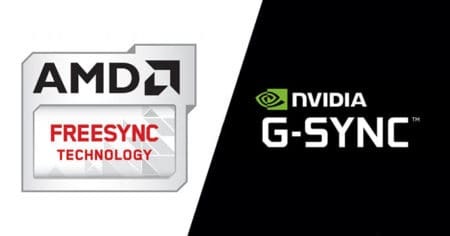 When it comes to competitive fast-paced gaming, we recommend TN panels instead which offer the fastest response time speed, but these monitors aren’t available in ultrawide formats. 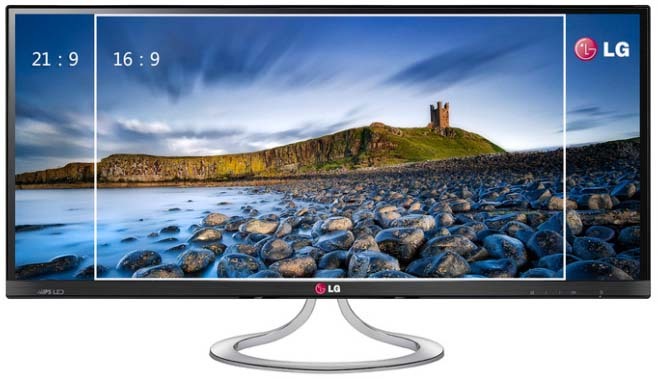 Other things that you should consider when buying monitor is the maximum refresh rate and VRR (variable refresh rate) technology of the display. 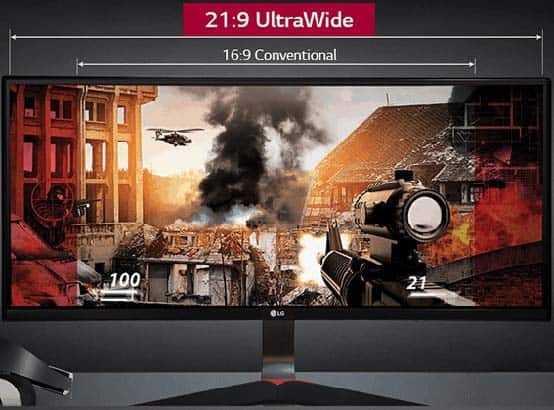 As opposed to the ultrawide monitors for productivity purposes, you may consider an ultrawide gaming monitor with a lower pixel density as the lack of pixels isn’t as noticeable in video games as it’s with office-related tasks. For instance, you can get a 34″ 2560×1080 gaming monitor with a 144Hz refresh rate which won’t have as crisp image quality as a 3440×1440 monitor, but it will provide you with an immersive gaming experience at an affordable price. For everyday use and home entertainment, we recommend ultrawide displays with VA panels as they are usually cheaper than the IPS models and offer a higher contrast ratio. Moreover, the 21:9 aspect ratio of ultrawide monitors is close to the native aspect ratio (2.35:1) at which movies are recorded making for a more cinematic and authentic viewing experience. 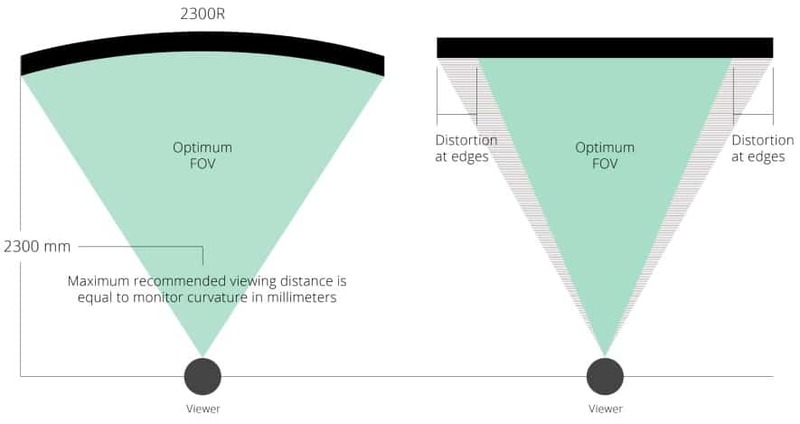 Lastly, with an ultrawide screen, you won’t run into potential issues that can occur with a dual monitor setup such as different calibration out of the box, aligning the monitors (if they are different models/size), lack of connectivity options on your GPU, etc. We hope you’ve found this article helpful. For more information and the best deals visit our best ultrawide monitors and best dual monitor setup buying guides. UltraWide vs 4K - Which Should I Choose? 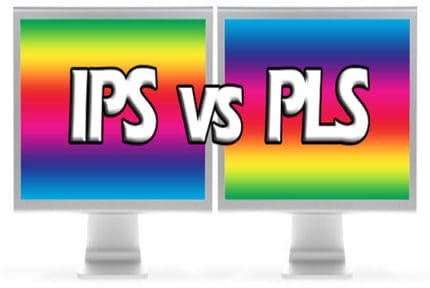 PLS vs IPS - Which Panel Type Should I Choose?